Changes of trend from annual and/or historic levels provide powerful reversal signals for individual stocks. Large numbers of these signals across the market frequently provide an early indication of a change in trend for the market as a whole. The blue bars in the chart below highlights the large levels of buying climaxes (a sign of exhaustion in the bullish camp) leading up to the early 2004 market peak. 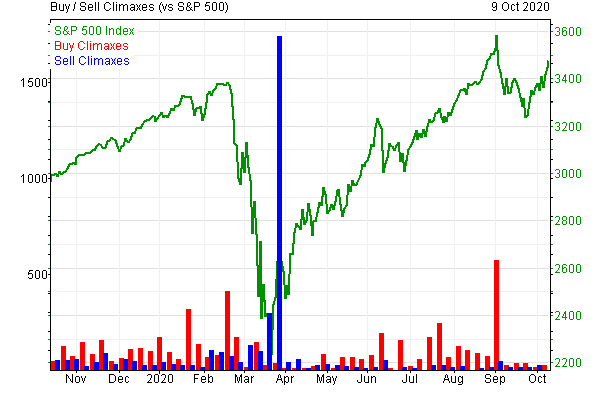 Similarly, note the high red bar in early August highlighting the large number of selling climaxes at the market low. As their name suggests, climax signals provide an early indication of a potential trend change and, importantly, at the right end of the range. A buying climax occurs when a new 52 week high is made, and the stock closes the week below the previous week’s close. A selling climax occurs when a new 52 week low is made, and the stock closes the week above the previous week’s close. Each week, our system scans over 6,000 stocks that we analyse and lists all the stocks generating climaxes. How can they help with market timing? The number of new 52 week highs or lows on the NYSE and Nasdaq is now widely used by investors to judge the momentum and extent of a market rise. Climaxes offer an insight into how many of these new highs or lows were final accelerations in the trend (a common signal before a change in direction). A large number of these signals provides a useful portent for exhaustion in the current market trend. We have been monitoring the weekly climaxes since 1992 and look for significant numbers to signal a potential change in market trend. What else can we learn from the climax data? A high concentration of climaxes in a particular sector will also pre-warn of a potential industry rotation out of one sector and into another.